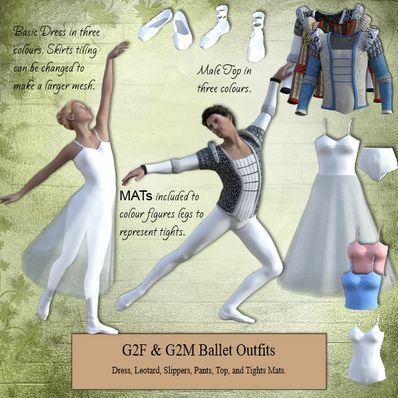 Ballet Outfit for G2F & G2M. Ballet Outfit for Genesis 2 Female and Genesis 2 Male,for use in Daz Studio 4.8. Oh, really wonderful set! Thank you so much! Thank you for such a wonderful outfit for both genders! Love the G2M jacket! Very nice male jackets and shoes which work well for G3M and render nicely in Iray. I added 'sheer greatness' leggings from DAZ Studio rather than recolouring legs. Many thanks! Thank you very much for this wonderful, perfectly styled set with all its lovely details!!! Thank you for sharing this amazing dancer outfit!!! Oh, outstanding! Thank you for the Mat colour figure leg option to represent tights, always love that! Beautiful work!! Totally enchanting, magnificent work. The tights are going to be a perfect fit :) Thank You!! Thank you Wendy. Lovely pieces! Just lovely - thanks for all of your generous gifts! Wow - that's stunningly beautiful! Amazing work. So pretty. Thank you for sharing. Have a wonderful weekend. Thanks for sharing your creativity, Wendy.